The first light of the day illuminates the sand-ripples at the sandy beach of Embleton Bay with the silhouette of Dunstanburgh Castle in the background. 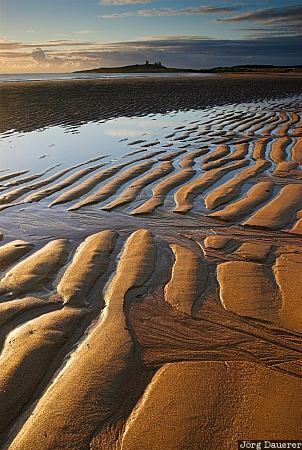 Embleton Bay is in Northumberland in the north of England, United Kingdom. This photo was taken in the morning of a sunny day in September of 2007. This photo was the image of the month in December of 2011. This photo was taken with a digital camera.